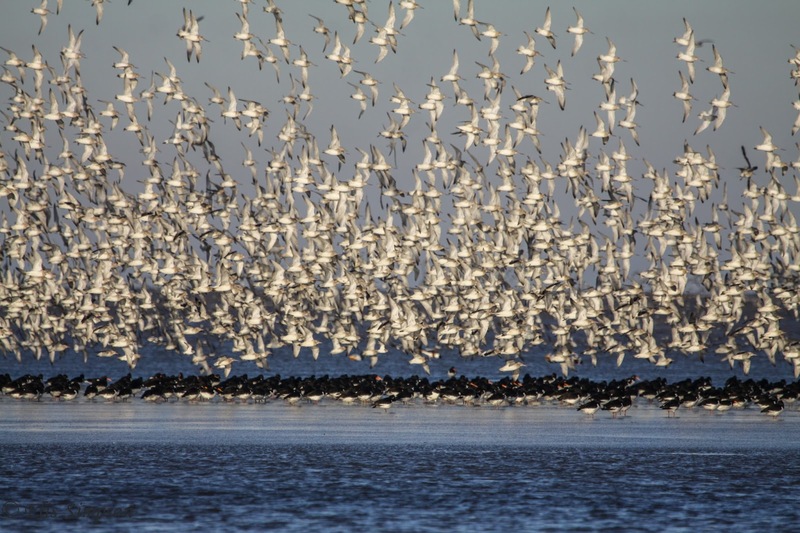 Wader Quest: Snettisham; a glorious wader watchers paradise. Snettisham; a glorious wader watchers paradise. If you, like us, find great pleasure and solace from watching inspirations of waders swirling over the mudflats, then you'll find few places as fantastic to visit as Snettishm RSPB reserve in Norfolk. 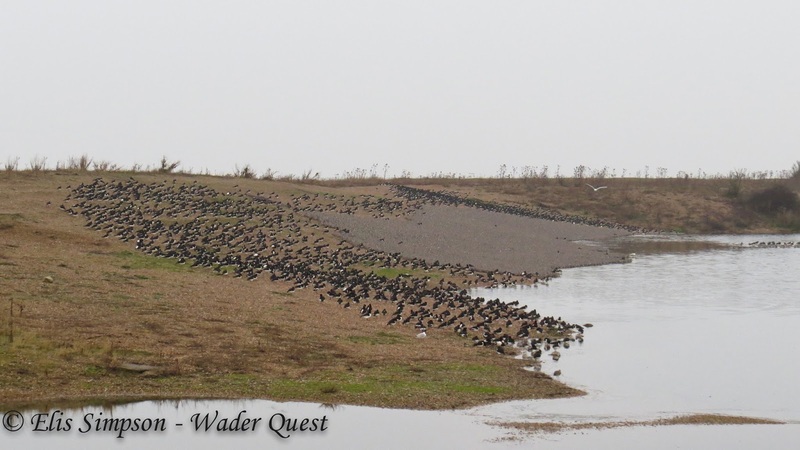 An inspiration of waders, mainly Bar-tailed Godwits overflying Eurasian Oystercatchers at Snettisham. 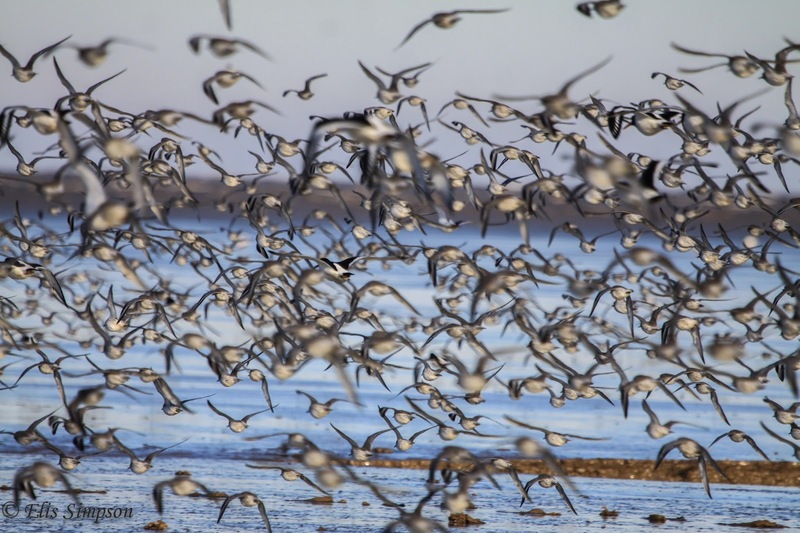 There, once the frenetic breeding season is over in the Arctic, waders will start to return and their numbers build over the winter. Some will move on further south, but many thousands will remain to entertain us with their aerobatics. The main protagonists are Red Knots and Bar-tailed Godwits which speed through the air (see our Raining Knots and Godwits blog) but there are all varieties of wader to be seen on the estuary, the dapper gentlemen in their tuxedos in the form of Eurasian Oystercatcher the stately Eurasian Curlew, a few Black-tailed Godwits, dashing Dunlins, scooting Sanderling, calico Ruddy Turnstones, aloof Grey Plovers, maybe a congregation of Eurasian Golden Plovers, the odd Northern Lapwing, some staccatto Common Ringed Plovers and small but select orchestra of Pied Avocets. The spectacle is overwhelming especially when the Red Knots that have been roosting on the pools of the reserve thunder just over your head as they head out to chase back the ebbing tide. Red Knots thunder over your head and out across the mud. These massive packs of Red Knots on the edge of the pool are a joy to behold. At first glance collectively they look like a slab of grey concrete, but then it feels like your eyes are playing tricks with you, as it seems to be moving, getting a feeling like you may have had one too many the night before. 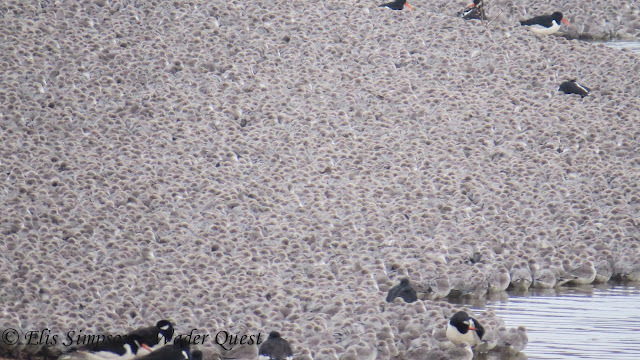 A slab of grey 'concrete' surrounded by a sentry parade of Eurasian Oystercatchers.. But closer inspection shows a mass of tiny birds, huddled together for safety, many with their bills tucked under their back feathers, but always a number with their beady little black eyes trained on the skies looking for predators. Watching these roosting birds, and the others that feed around the pools, without disturbing them is always fun, and best achieved from the relative warmth and safety of a hide. 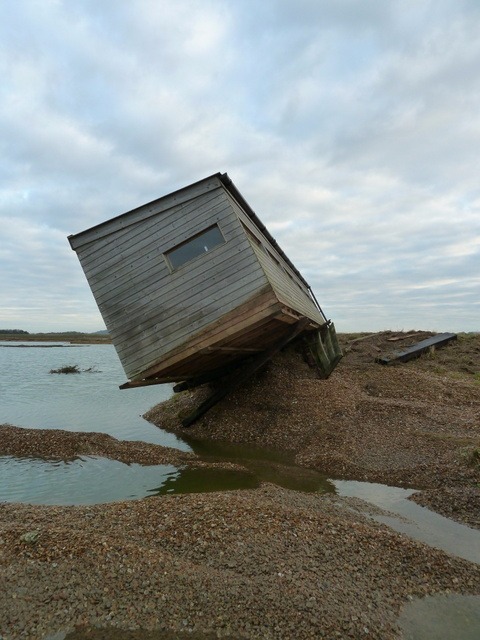 Unfortunately at Snettisham a ferocious storm destroyed the hide on the shingle bank, but plans are afoot by the RSPB to replace the hide and make these simple pleasure once more attainable. The rub is it is going to cost a pretty penny. 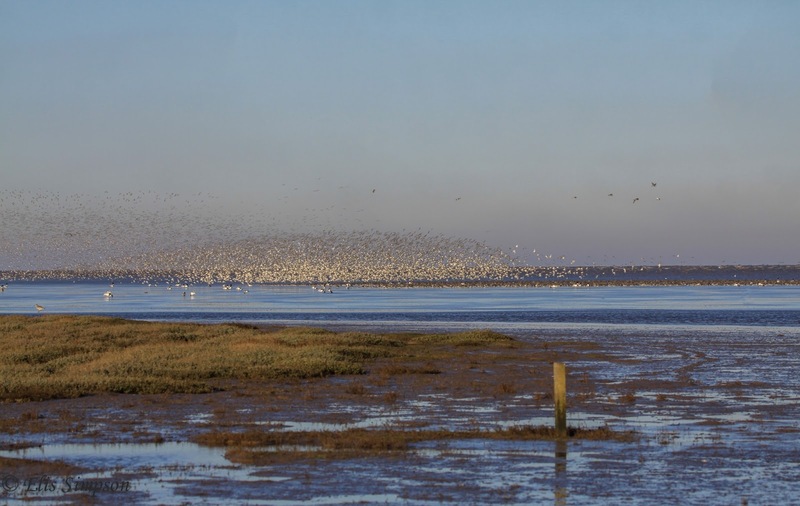 If you would like to see a new hide to maximise your enjoyment of the Snettisham reserve, and are disposed to help, the RSPB have set up a crowdfunding scheme to make this happen, if you would like to contribute and gain one of the rewards, the details of which can be found here. Hopefully we'll see you one day at Snettisham, either in the new hide when it is done or on the watch point. See you there.